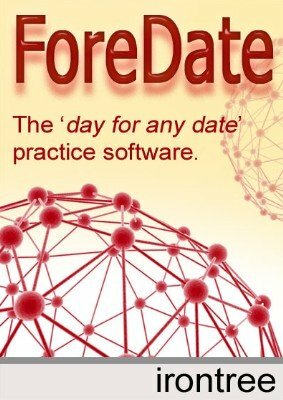 If you perform the “Day for any Date” effect (or intend to add it to your repertoire), ForeDate is the software to help you practice your skills and polish your performance. Learning the maths involved in the 'Day for any Date' effect is not hard - providing yourself with realistic practice situations is. ForeDate is designed to help with that. It acts as a virtual audience: choosing dates and expecting you to come up with the actual day for that date. You have full control over the delay before the program reports the actual day - from almost half a minute, to a blisteringly fast few seconds. The most unique feature, however, is that the program supports speech. Now you can hear dates being called to you, so you don't even have to look at the screen. With this, 'virtual audience' asking you about specific dates you can sharpen your skills and polish your performance in as realistic a way as possible. You can customise the look of the Calendar screen by dragging in different images. Bored with that mountain? Drag in a cute frog, or reward yourself with a handful of jelly beans. You can drag in your own images too, or download custom collections of our very own 'Background Images'.